Join the discussion on our forums! Come discuss Strongshell Scavenger over in our dedicated Strongshell Scavenger discussion topic. this card is great. even with 1 taunt it is better than Chillwind Yeti. if u have more than 3 taunt, value goes insane,nearly auto win if your opponent isnt warlock or paladin.Devolve also a little bit annoying but druid great against shaman with their stupid new card "ultimate infestation". But River Crocolisk has the beast tag which is significant, especially in druid. I'd say it's closer to Gnomeferatu. Only good if taunt druid becomes a thing. Plus you need to hit at least 2 taunts for this to be worth it. If you hit one taunt it's decent. If you hit two it's great. If you hit none it's a disastrous loss of tempo. A two-turn combo in the late game? If you can pull it off, sure. 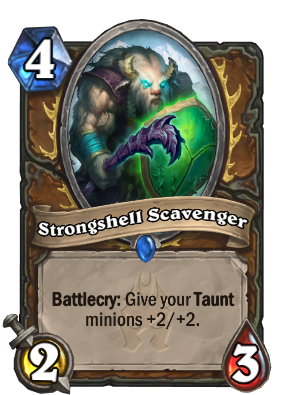 I think this guy is our first Taunka in Heartstone. Does each expansion gets a different creative director ? What on earth are you talking about? It's a taunka, who only live in northrend. it's thematically appropriate for the expansion. seems clunky but can work out. Taunt Warrior is kinda decent right now, somewhere around Tier 2 I believe so... no point in adding more taunt synergy to it. Druids could have a use for it though, since they already have some really strong taunts.